Etiquette skills include much more than simply remembering to keep those pinkies up. Knowing the proper etiquette for any situation can mean the difference between getting a job, impressing the in-laws, or retreating home with head hanging low. As more people learn the value of etiquette, the demand for learning such skills continues to increase. With the proper skills and training, teaching etiquette classes for both adults and children can be a lucrative business. Step 1: Review your etiquette skills by reading books such as Judith Martin's Miss Manners' Guide to Excruciatingly Correct Behavior or Amy Vanderbilt's Complete Book of Etiquette. To teach children, review Sheryl Eberly's 365 Manners Kids Should Know. Visit the International Etiquette Centre to learn quick etiquette tips or take a course to become an etiquette consultant. Step 2: Plan your class by creating your own curriculum or use prepackaged teaching curriculum materials, such as the various programs at Etiquette Outreach or Etiquette Moms. Decide how often, where and when you will teach. Set your class prices. Step 3: Announce your class to local schools, libraries, businesses or other locations that may want to utilize your services. Make flyers or business cards, post ads and advertise via any other local venues. Step 4: Hold your class on the date and time announced. Pass out any handouts or reading lists you have prepared and announce expectations for the course. Step 5: Conduct your class according to your teaching plan. 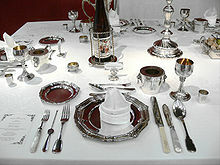 Use props such as dinnerware and phones to demonstrate proper etiquette techniques. Allow students to practice these techniques together through role playing. Step 6: Wrap up your lesson with a review and ask if there are any questions. Give a verbal quiz if you wish to assess how much students learned. Provide assignments for homework if you will have multiple class sessions. Churches often charge small fees or allow free space for class use. It can be helpful to create a website to provide further details about your classes, such as contact information, dates and pricing. Check to see if you have any local homeschooling groups that may be interested in your etiquette classes. Local schools, businesses and libraries may also wish to employ you to provide classes or assembly content. Remain professional and courteous while teaching in order to lead by example. Be up front with clients about your experience and credentials to avoid possible litigation. You may also wish to create a release form for students to sign stating that your class does not guarantee a job or any other direct benefits.